Haddington lies on the Great North Road, twenty miles to the east of Edinburgh. Though long bypassed by the A1, its position has through history meant it has served as a gateway to Edinburgh and to central Scotland. This has placed it in the path of more than one of the many marauding armies to have trodden this route over the past thousand years. 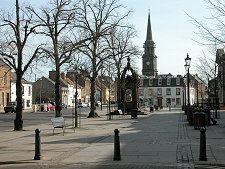 Haddington's origins lie very early in history and there was certainly a sizable settlement here by 1000. 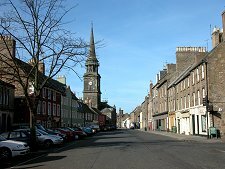 In the 1100s David I made it a Royal Burgh and the county town of Haddingtonshire. From 1139 there was a Franciscan church here, and Ada of Northumberland established a nunnery a little to the east in abut 1155. A remnant of the nunnery property survives in the shape of the ruin of St Martin' Kirk. A friary and a royal castle were established during the 1200s. 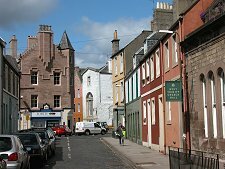 The 1300s saw the town suffer repeatedly from the attentions of English armies and in 1358 the River Tyne flooded much of Haddington and washed part of it away. Despite all this Haddington continued to grow in size and influence. Through its port at Aberlady, five miles to the north, it established important trade links with northern European ports. The 1400s saw the completion of St Mary's Church, the largest parish church in Scotland. This replaced an earlier church of the Grey Friars. This had been known as the Lamp of Lothian, and was destroyed by the English in 1356. But there were more setbacks in the 1500s and in 1548 another English army was in control of the town. Though historically on the main road to Edinburgh, Haddington was bypassed when the railways came to Scotland. It ended up being served by a branch line from about 1850 to 1968. The only evidence of this today is the Railway Hotel, at the western end of Court Street. Haddington was also a very early recipient of a road bypass. From the 1930s the traffic along the A1 was taken out of the town along a new road to the north. In the 1970s a new dual carriageway A1 was built, a little north again of the original bypass. More recently this has itself been upgraded as part of wider improvements to th A1 east of Edinburgh. 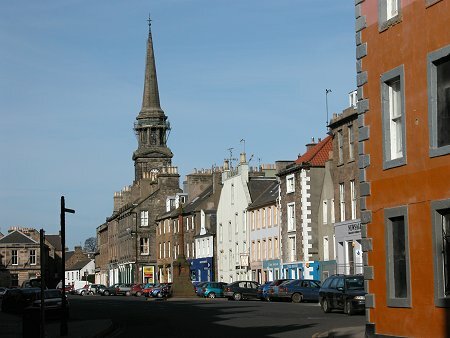 The centre of Haddington is built attractively around the core of High Street and Market Street. This gives two wide parallel market areas, separated by buildings and a warren of wynds and lanes. 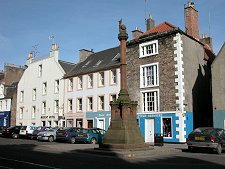 The mercat cross is in High Street and the two streets come together at their western end on either side of the Town House. 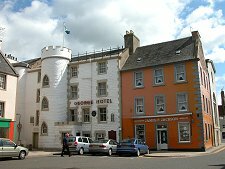 This was built in 1742 with some of the textile wealth then starting to flow into the town, and its spire dominates many views of Haddington. It continues to be used today by East Lothian Council. To the west of the Town House is Court Street. Here the wide street and grand buildings contrast strikingly with the earlier pattern of building evident in High Street and Market Street. 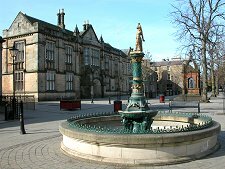 The main council offices have broad pavements in front of them, decorated with fountains and statues. On the north side of Court Street is a collection of very fine buildings housing banks. Here, too, is Haddington's post office. 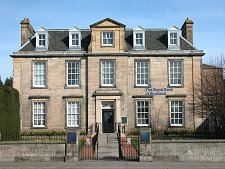 This can trace its history back to 1603 when it was one of the very first post offices in Scotland, servicing the mail between the newly unified capitals of Edinburgh and London. 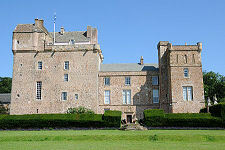 A mile to the south of Haddington is the magnificent Lennoxlove House, home to the Dukes of Hamilton.